Can having a secular background help prepare you for ministry? Before we got into whether or not the world will end in 2012, Mark shared with us how the Lord had taken him on an unexpected route on his way to becoming a full-time pastor. It is an encouraging story about finding one's place in God's will. Nathan Jones: Dr. Hitchcock, I love reading your books, and particularly I would like to know a little more about you as this is the first time I have gotten to meet you in person. Dr. Hitchcock: Well, I grew up in Oklahoma City area. I went to Oklahoma State University. Then I went to law school after that and I worked for four years at the Oklahoma Court of Criminal Appeals for a judge there. Then, I left there and went to Dallas Seminary and came back to Edmond, Oklahoma where I have been the Pastor of Faith Bible Church there now for 18 years. It is hard to believe it has been that long. Nathan Jones: With you being a lawyer, what really got you into Bible prophecy? 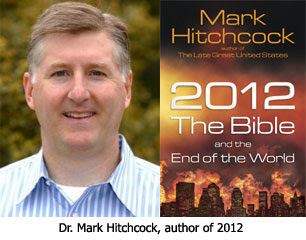 Dr. Hitchcock: I got interested in Bible prophecy as a young man of about 12-13 years old. Late Great Planet Earth came out in May of 1970 when I was 11 years of age. The people in my youth group and my sister who was a couple years older than me — all these young people were reading this book. I remember reading it as a boy and understanding that it really has to do with what is going on in our world today. Like a lot of young people I was kind of dormant in my spiritual life for awhile. Then, in my early 20's when I began to study the Bible, I just realized there were large portions of the Bible I had no idea what they were about. I came to see that if I was going to really understand the Bible, I had to understand Bible prophecy. So, that's really what got me interested. What I would really say for myself is that I have a love for Bible prophecy, but really I love the Bible. And to me, if you love the Bible which is almost one-thirds prophecy, then you are going to love prophecy. So, I don't consider myself as someone who is necessarily in love with prophecy. I just love the Bible, and prophecy is a big part of it. Dr. Reagan: Now that you have become a Bible prophecy teacher, lecturer, writer, and so forth, and you look back on your life, how would you say your legal training has helped you? Dr. Hitchcock: When you go to law school you learn how to examine evidence and not just take what people say at face value. One needs to look at the evidence, examine it, and think critically about it. I think the experience I had in law school shows God's providence in our lives. I went to work for a judge researching and writing opinions for him. I had no idea that I was going to become someone who wrote books. You can look back on your life and see how God was really guiding and leading your life every step of the way for what He ultimately wanted you to do, back when you didn't even know it. Dr. Reagan: Same thing happened to me. I ran from the Lord for 20 years. You weren't running, but I was, because the Lord had called me and I said, "Here I am, Lord, send anyone but me." And, I finally came to the end of myself and said, "Okay, Lord, I am tired of this." He then handed me a ministry in Bible prophecy. For 20 years I had been teaching International Politics and Bible prophecy and the end times is all about international politics, so even when I was running He was preparing me for what He wanted me to do. Nathan Jones: I experienced a similar path to full-time ministry. After Bible school I served at the headquarters of a mission board to prepare myself for the mission field. After two years there my wife and I were preparing to go to Brazil to work with street children. The candidate director suggested I get some real world experience first, so I moved on from the mission. I quickly discovered a Bible degree will not get one full-time secular employment, so I went to tech school and discovered a love for Web development. I gained a lot of experience in Internet banking and then working for a large ISP building websites and ecommerce packages for our clients, as well as starting my own Web development/design business. As much as I was enjoying my work, it felt far from the original goal of going to the mission field. And then, I saw online that a mega-church in Kentucky was looking for someone to build and maintain their website. This was an opportunity to merge my technical skills with my ministry training in service of the Lord. After six years at the church and time in seminary, through a mutual friend I found out Dr. Reagan was looking for a Web Minister to reach the world for Christ over the Internet. I moved to Texas and found that now my reach was no longer just to a single congregation, but to the entire world. My mission field just expanded potentially to over two billion people. I look back now and see how God had been preparing me for a mission field beyond my wildest dreams, and feel so blessed to be a part of His work. Dr. Hitchcock: It is wonderful to look back on our lives and see how God has worked. I think doing that can be an encouragement to parents watching their children and even young people who are wondering about what God wants them to do. Just follow what God is showing you to do and along the way He will be preparing your path. Question: How do you know when you are where God wants you to be? I don't think I'm running from God, but I just can't seem to find satisfaction in where I am. I'm reading Dr. Reagan's "Trusting God" for the second time in a month, and I'm getting huge amounts out of it, but I just can't get a handle on how one knows. I usually know when I'm not where God wants me to be because I feel horrible about myself. Could that be a clue? I tend to focus on my actions and being right with God and not really about my job, my financial situation, my family, my friends, etc. Maybe because I'm blessed in those areas but seem to mess up too often in my actions. How goes it today Thunder??? Better?? Yeah. Thanks for asking Junbuggg. Son of Thunder asked: "How do you know when you are where God wants you to be?" A most excellent question, Thunder. What Christian hasn't faced down that question, so we all know the frustrations. From my own experiences and those who've shared with me, I have to conclude - we never fully know. Sure, we may feel at peace at times and have Christian confirmation by others, but we have our days of doubt, don't we all? I think God uses this to keep us trusting Him. God just wants us to go out there and give it our all for Him, and He blesses it. Kind of like riding down a river in a raft, the water carries us down different channels and streams. The Holy Spirit carries us along in life. We're only to take care of the boat we're in during this brief life. And so, just keep living right and ministering and witnessing, Gang! Don't drive yourself crazy trying to determine if you're where God wants you. Leave that part up to Him. Just mind the boat. Proverbs 3:5 Trust in the LORD with all your heart, And lean not on your own understanding; 6. In all your ways acknowledge Him, And He shall direct your paths. My late Bible teacher explained it like this. You are sat in a car to begin your journey on a narrow road; after a while you suspect you are going in the wrong direction. In order to turn around, you must make several reverse, forward, reverse movements (three point turns in U.K.). Eventually you are at last heading in the correct direction. It may take more than three turns of the wheel, but The Lord is patient and will allow you to go at a speed you can safely manage. Ah! yes, well, y'all inherited that from the French. It's down to gallantry, don't ya know! A gent walked beside His lady on the left, so ifn a rougue started a fracas, the gent had his bird on his left and could draw his sword with his strong right arm! The French changed it to the left just to be awkward cause we held up two fingers at em - to show we was best at archery. Either that or they was all lefties. Spiritually speaking I shouldn't wonder ifn you don't know if youm cumin or goin'driving on the right side, how you gonna draw yer sword then? "Bloomin' cheek" is a phrase I never thought I'd read on, well, any blog, ol' boy. And I did like the driving analogy (you Brits like your cars almost as much as we do, I think). I've, in the past, likened it to racing. Here in the States, we have NASCAR which uses a person called a "spotter". This spotter stands up on the top of the grandstands and his job is to watch out and keep his driver out of trouble and keep him calm. I kind of liken that to the Holy Spirit. We only get into trouble when we don't listen, like that guy driving at 190 mph. "I kind of liken that to the Holy Spirit. We only get into trouble when we don't listen"
Absolutely! 100%! As I have learned to live and regret! About 25yrs ago, The Lord cautioned me to keep away from two particular brands of church. I listened and obeyed. Time passed and the one church changed it’s ‘umbrella’. Then I ‘leaned to my own understanding’ and decided this change of ‘umbrella’ meant it was safe for me to take my youngest, then teenage son for fellowship. Not surprisingly, things went wrong so we left dependently of one another about eight years later. It wasn’t all bad because he met his lovely wife there and now has three children. Not sure when, but recently the church people they new got hold of them and listened to what they had to say about a new pastor. With a change of pastor it went back under the ‘umbrella’ the Lord had warned me about. Now they are back in that church I introduced my son to and it is now ecumenical, purpose driven going emergent. I warned them it is now a cult but to no avail. My son is in such a mess, and he sees me as his worst enemy and even on Christmas morning, refused to speak to me. Now I am in the painful position of trusting the Lord to remedy my ignorant mistake and to gradually turn my family back to the truth. my folks made a simular mistake. i was raised in alaska and when i was bout 10 my mother really felt God wanted our family to move to eastern washington but we had a good church, a decent christian school and a job. the pastor left the church and the church fell apart, so did the school some of my brothers and sisters got into trouble now, several years later half of my siblings are not christians (were they ever to begin with?) my dad is one but very carnel it goes on. my mother firmly believes we shoulda moved then. Your mum is right, but like me, we both questioned what The Lord was saying and made the wrong decision. Neither of us did it deliberately, we have to be merciful on ourselves (not easy though). The Lord knows we are but flesh, he wants to protect us from learning the hard way (as I wanted for my son) but sometimes the hard way has to happen. My point is that your mum and I have to wait now, and trust The Lord to "get them turned around" like the Prodigals they are. Don’t forget he was still the son of the father, his relationship was intact it waas his fellowship with the father that was broken. They may all have to 'eat a few buckets full of pig swill', but they will come back, just you wait and see, then we can "kill the fatted calf" and rejoice together. This isn't 'positive thinking', it is faith in God, in action! Junbuggg Thank you (big hug). My son is also my brother in Christ, so what keeps me trusting is Romans 8:8 “And we know that ALL things work together for good to those who love God, to those who are THE called according to His purpose”. As you say – it is at least Biblical and we are warned about these things by the author and finisher of our faith. I sympathise with the diabetes; I’m ‘sugar intolerant’ and trying to keep it at that! Junbuggg, glad to hear you got through the knee surgery aok and are on the road to recovery. We prayed for you this morning in our ministry's devotional/prayer time. hartdawg said... "i need a hot girlfriend to solve all my problems"
Hartdawg, Dr Reagan has written a book I found pretty helpful. Have you read it? It's called Trusting God. It's hard to put into practice and I have to dig it out every now and then when I get sidetracked. Ms Bynx here: Take heart all of you. I am now old and watch my beloved kids (5 living/47 to 55 yr old): One once was a druggie for 12yr and one spent 6 yr in jail, one is still stuggling w/herself image, two are sure of their life with the Lord...I never tho't to see the day when my children would ever belong to and trust in the Lord because of the men of my church, my children's own father and the life we were forced to live by him. Even he became saved 2yr before his death after telling all he was a X'n for some 47yr.